Transition metal dichalcogenides (TMDs) are layered semiconductors that can be exfoliated into layers only a few atoms thick. Recent research has shown that some TMDs can contain quantum light sources that can emit single photons of light. Until now, the occurrence of these quantum light emitters has been random. Now, researchers in the Graphene Flagship working at the University of Cambridge, UK, have created large scale arrays of these quantum emitters in different TMD materials. The work, also involving researchers from Harvard University, US, is published in Nature Communications. This new approach leads to large quantities of on-demand, single photon emitters, paving the way for integrating ultra-thin, single photons in electronic devices. Quantum light emitters, or quantum dots, are of interest for many different applications, including quantum communication and networks. Until now, it has been very difficult to produce large arrays of quantum emitters close together while keeping the high quality of the quantum light sources. "It's almost a Goldilocks problem - it seems like one either obtains good single photon sources, or good arrays but not both at the same time. Now, all of a sudden, we can have hundreds of these emitters in one sample," said Mete Atatüre, a professor at the Cavendish Laboratory of the University of Cambridge. The random occurrences of quantum dots in TMD made systematic investigation difficult. "The ability to deterministically create our sources has made a dramatic change in the way we do our day-to-day research. Previously it was pure luck, and we had to keep our spirits high even if we didn't succeed. Now, we can do research in a more systematic way," said Atatüre. Not only does this new method make performing research more straightforward, but it also leads to improvements in the emitters themselves: "The quality of the emitters that we create on purpose seems to be better than the natural quantum dots." Dhiren Kara, a researcher at the Cavendish Laboratory, said "There is lots of mystery surrounding these emitters, in how they originate and how they work. Now, one can directly create the emitters and not have to worry about waiting for them to appear randomly. In that sense, it speeds up a lot of the science." 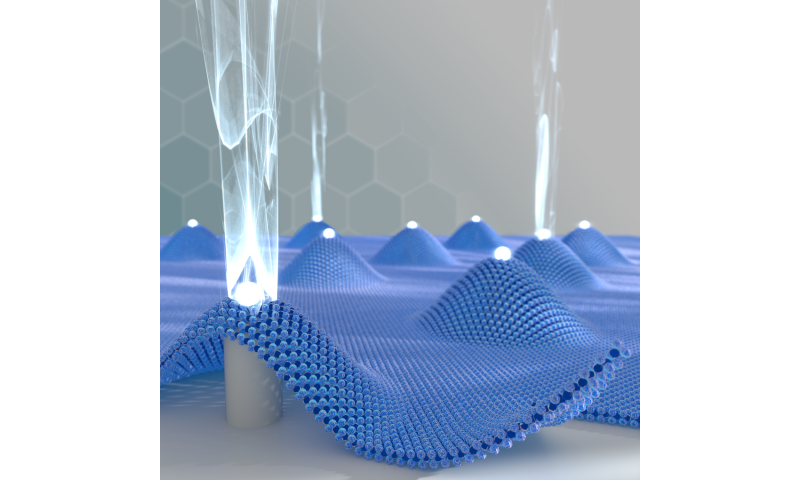 To create the quantum light sources, the researchers cut an array of nanoscale pillars into silica or nanodiamond, and then suspended the few-atom-thick TMD layer on top of the pillars. The quantum emitters are then created in the TMD where it is supported by the pillars, so it is possible to choose exactly where the single photons should be generated. "The fact that the emitters are generated in a mechanical way is good, because it means that they are quite robust, and material independent," said Carmen Palacios-Berraquero, a researcher at the Cavendish Laboratory and first author of the work. The deterministic and robust generation of quantum sources means new opportunities for hybrid structures of photonic and electronic functions layered together. The quantum arrays are fully scalable and compatible with silicon chip fabrication. Andrea Ferrari, Science and Technology Officer and Chair of the Management Panel of the Graphene Flagship, was also involved in the research. He added "Quantum technologies are recognized as key investment areas for Europe, with a new Quantum Flagship recently announced. It is great to see that layered materials have now a firm place amongst the promising approaches for generation and manipulation of quantum light and could be enablers of a future integrated technology." Place your bets people ... 5 Years until quantum computers hit the retail market ? IBM has been offering quantum processing service online via cloud for about a year now already. 5 qubit processors have been on the very high end market for about 2 years maybe 3, and talk is already out there about about Microsoft working with quantum computing in order to bring a consumer version to market, at the very least a cloud based service akin to IBM's.